This beautiful '5-star' rated* condominium surrounds you with authentic... turn-of-the-century appointments - yet every hi-tech convenience - with easy ski in/ski out Town Lift access. It's your most carefree ski vacation ever…just leave your car in our covered parking and walk mere steps to the lifts. Or hop on the free shuttle bus to Deer Valley and The Canyons. Then come inside to the warm, welcoming luxuries of one of the finest-appointed 2 bedroom 2 bath non-smoking lodgings in historic Park City. Leave your gear on the custom built-in boot & mitten warmers as you snuggle down by the gas fireplace, both bedrooms have Sony - 49" Class (48.5" Diag.) - LED - 2160p - Smart - 4K Ultra HD TV with High Dynamic Range. We've just updated beds to Simmons Beautyrest World Class Resonance 13.5" Plush Mattresses. Living room now has the opulent recessed in-wall Sony - 55" Class (54.6" Diag.) - LED - 2160p - Smart - 4K Ultra HD TV with High Dynamic Range with theater audio surround sound, a fully-equipped gourmet kitchen, two soothing jetted bathtubs, beautiful original oil paintings, distressed Town Lift Condo, Park City, Utah Hickory floors, burnished oil-rubbed hardware, with panoramic bay window views overlooking historic Park City Main Street shopping, galleries and restaurants. Town Lift Condos creates a great overall experience. Try it as you will love staying here!! It is in the heart of it all! We could not be more pleased with the accommodations, the location, the way we were treated for our special vacation! thank you for kind review. We are looking forward to your return. I really enjoyed my stay! Park City was all the more fun on Main Street with all of the shops, restaurants, free transportation and ski lift right outside. We hardly had to use the car because everything was so close! I stayed during Christmas break and over the summer, it was amazing. The condo was very cozy, had a nice TV, comfortable beds, a fireplace, and great service. 100% would recommend to anybody planning to go to Park City! Dear Nora, we are looking forward to your return. 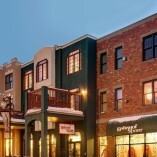 Fabulous place to stay while enjoying all that Park City has to offer! Great location, amenities and style says it all! thank you for your review. Looking forward to your return. We had just a great time in Park City! The condo was absolutely great, clean, well appointed, on the top floor. We stayed in Unit 3C and it was well decorated with items you can not see anywhere else, many dating back to over 80 to 100 years ago. The location is incredible, especially if you are a skier and love the Old Town atmosphere. Underground parking, restaurants all around you. Ski-in Ski-out. I highly recommend staying in any of the units here. thank you for the review. Looking forward to your return.